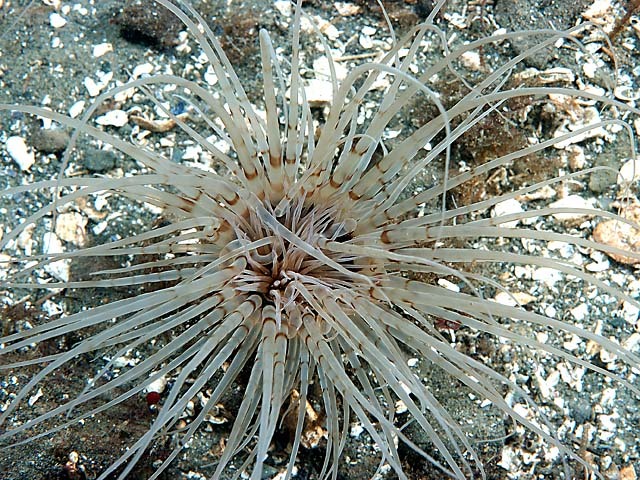 This common anemone is found on mud and sand bottoms around Puget Sound at depths ranging from intertidal to about 100’. A unique feature of this anemone, which is actually a coral, is that it makes a parchment-like mucus tube to live in. Most of this tube is actually buried below the mud, and is not visible to divers. Below what you see is a dark-colored, slime coated tube that can extend several feet below the substrate in large animals. These anemones are often found in large fields, where they can reproduce to rapidly cover favorable territory. The mouth, placed on the central disk, is surrounded by short labial tentacles and longer marginal tentacles. The semi-translucent tentacles may be white, brown, black or orange. This species grows to a height of about 12” and covers a range from Alaska to Baja California. The tube-dwelling anemone is the favorite food of the giant nudibranch (dendronotus iris), which will launch itself at the head of the anemone with amazing speed, and will frequently be pulled part way into the tube of anemone as it retracts. Predation by such nudibranchs is rarely fatal to the anemone. Please click on the photo of the tube-dwelling anemone for a larger version of the same picture.